Elio Motors recently emerged from a months-long period of silence with ostensibly promising news of a $2.5 million investment from Overstock.com, a website that surprisingly still exists. Only now we know just how badly Elio needed it. By the end of 2017, Elio didn’t even have enough cash on hand to buy one of its own vehicles, according to a report filed Friday with the Securities Exchange Commission. In the report, an annual filing that lays out Elio’s current financial state, the company explains that it only had $7,155 in cash as of December 31. That couldn’t even cover the base price of Elio’s hypothetical three-wheeled demi-car, which starts at $7,450. As of December 31, 2017, we had cash of $7,155 and a working capital deficit of $49,674,327 as compared to cash of $120,206 and a working capital deficit of $42,280,863 at December 31, 2016. The increase in the working capital deficit was due primarily to the decrease in cash and restricted cash as a result of principal payments made on the note payable due to a related party and payment of property tax. A quick glance of the report reiterates much of the points Elio offered last fall in a separate filing, when it registered an initial public offering valued at $100 million that has since been pulled. To launch production and generate profit, Elio says it needs to raise an estimated $376.6 million in new investment. That estimation is based on a generous assumption Elio will obtain $110.5 million in additional reservation deposits, the filing says, along with a sales margin of $44.1 million generated from initial customer deliveries. “To the extent that we do not continue to receive reservation deposits, the amount needed to be raised from new investment will be higher than $376.6 million,” Elio says. The filing sheds light on some of those payments. And it shows the $2.5 million could dry up quickly. Within a week of Overstock announcing its investment, Elio reported paying $162,500 toward the balance of a $650,000 loan from a company called CH Capital Lending LLC. As of June 1, the filing says, Elio is required to pay CH Capital $50,000 per month. The company also paid CEO Paul Elio a salary of $213,452 in 2017, while its chief financial officer earned $149,479. A recent ruling from a Louisiana judge also requires Elio Motors to pay a $76,500 fine—a better turnout than the original $545,000 that was levied by the state—but the startup says it plans to appeal. Residents of Caddo Parish, Louisiana, have long considered Elio a thorn in its side. The company initially promised production of the three-wheeled vehicle would begin in 2014, before funding problems delayed the launch several times. Paul Elio visited the area last month and repeated the company’s latest start time of late 2019. “We are ready to succeed,” he told reporters. 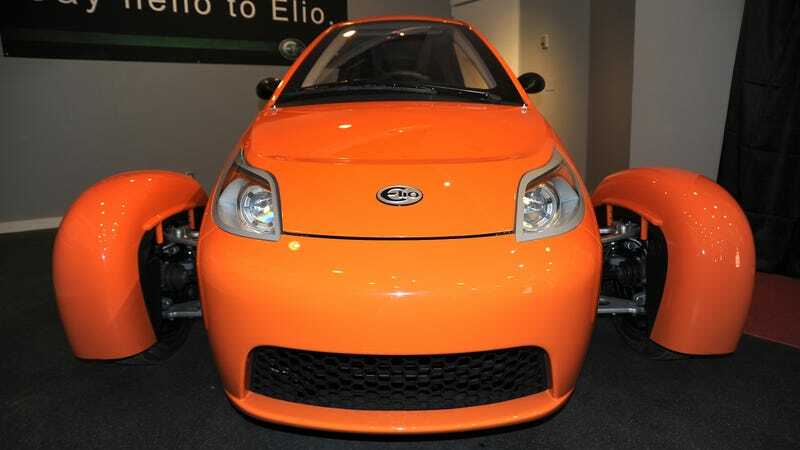 That’s contingent on Elio Motors’ effort to raise funding by launching its own cryptocurrency, the ElioCoin. The company says, once the financing is secured, it’ll need 76 weeks to launch production—putting it in line with a hopeful launch of December 2019. Start your clocks. Again.